Solenoid valves are used to control the rate of flow in fluid and air powered tools, systems, and motors. Washing machines and gas boilers use these valves, as well as hydraulic pumps and air hammers because they are diverse enough to perform both simple and complex tasks with ease. Solenoid valves can be customized to suit specific needs and can be utilized to control a variety of mediums such as air, electricity, gas, steam, and oil. 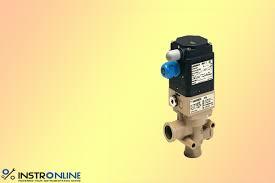 The most common solenoid valve is the two-way valve. A two-way valve only has two ports, whereas more advanced designs may have three or more, depending on what it will be used for. All solenoid valves, no matter the design, are specified to be one of two general types: either a direct acting valve or a pilot operated valve. In a direct acting solenoid valve, a coil magnetically opens the valve in a direct action, lifting the shaft and the seat of the valve without depending on outside pressure. In pilot operated valves, the plunger opens up the pilot opening while built-up pressure causes the valve to open and close. Although piloted valves require less electrical energy to operate, they usually need to maintain full power in order to remain in an open state, and they perform at a slower rate than direct acting solenoids. Direct acting solenoid valves only need full power when opening the valve, as they can hold their open position even when operating on low power. Each of the two ports on a two-way valve is alternately used to permit flow as well as close it off. A two-way valve can be specified to be either “normally open" or “normally closed” in its operation. With a normally open valve, the valve remains open until some type of current is applied to close the valve. Suspension of the electrical power causes the valve to automatically reopen to its normal state. A normally closed solenoid valve is the most common, working in the opposite fashion, remaining closed until a power source causes it to open. Three-way valves come with three ports. These are commonly used when alternate and exhaustive pressure are required for operation, as with a coffee machine or dishwasher. These valves can have four or more port connections. Four-way valves are commonly used with a dual acting cylinder or actuator. In this version, half of the port connections supply pressure, and the remaining connections provide exhaust pressure. You can specify these valves to be either normally closed, normally open or universal. Before purchasing a solenoid valve, be sure to do enough research to select the proper valve for your needs. Take note of what specifications will be required for the system, and consider what type of fluid will be used in operation. Also, take into consideration what type of material should be selected for the seals. Whether your equipment uses steam, gas, or air, selecting the right solenoid valve is crucial to its proper operation.